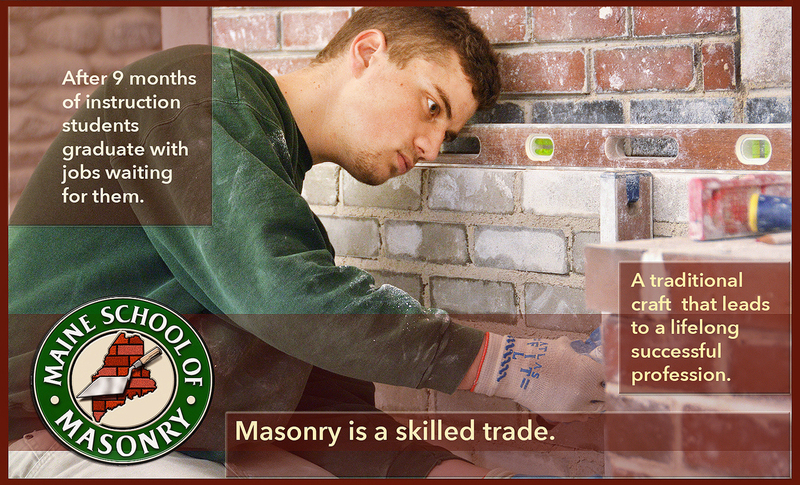 Masonry is a skill that cannot be outsourced and we encourage everyone interested to apply. It’s a wonderful profession where you can be your own boss and what you create will last hundreds of years. The Maine School of Masonry offers a chance for anyone to become a skilled craftsman in 9 months, additional courses in historic restoration and preservation will add to the student’s solid 1,200 hour certificate program foundation. Becoming a quality mason is more than ensuring a plumb line is exact when leveling out a brick or stone walls, although every student has to learn these basics. It’s a craft that requires sensitivity to the materials and that only comes from good training and experience. Like any other art, the mason has to have an instinctive feel for the craft. The school’s instructors bring out a student’s talents as they build different projects in the workshop or on location building in the community. Any graduate will have the skills to start their own masonry business if they want to, or they can easily get a high earning job in the business. Job placement is available for graduating students. The one-year Mason Apprentice Certificate program is designed for the student to develop professional skills and knowledge in the brick, block and stone masonry fields. The student will develop those skills through laboratory projects, classroom instruction and by putting their new masonry techniques to the test in the community by helping local building/renovation projects. Classes run daily 8:00 a.m. to 3:00 p.m., Monday through Friday. Construction safety, tools and equipment, brick manufacturing – including a tour of a brick factory – , mortar, bonds, 4” & 8” brick wall construction, estimating, cleaning, piers, arches, chimneys, fireplaces, 4′, 8” 12”, block wall construction, block manufacturing, glass blocks, retaining walls, paving, dry and wet lay, and veneers. The photos in this slide show exhibit many of the different classes and field trips. Students must complete 1,200 hours of instruction, including completion of numerous assigned projects during the entire course to graduate. The certificate course runs from September to the end of May each year. Please download the APPLICATION FORM. Then fill it out and mail it to: Maine School of Masonry, 637 Rangeley Road, Avon, Maine 04966. Restoring historic buildings is a specialized skill that demands high paying wages. The renovation and preservation courses take students through materials and processes of proven methods to conserve, repair and preserve stone and brick buildings, statuary and monuments. In partnership with the owners of historic landmarks and with the state’s approval, Mitch and his students have begun work on restoration and preservation projects at the Kennebec Arsenal, Fort Knox, The Old Wiscasset Jail and Rangeley’s Historical Society. The Stone Restoration and Preservation course is taught in the autumn and the Brick Restoration and Preservation course is taught in the spring. Together they make a full year advanced program. This course teaches appropriate approaches and techniques for preserving and repairing historic stone structures. It will take the student through learning the materials and processes of proven methods to conserve, repair, and preserve stone buildings, statuary, and monuments. This course is similar to the Stone Restoration course but unique to the properties of brick restoration which are varied and characteristically different. It takes a trained mason to be able to discern the differences in brick. The course teaches appropriate approaches and techniques for preserving and repairing historic brick structures. The training will take the student through learning the materials and processes of proven methods to conserve, repair, and preserve stone buildings, statuary, and monuments. The content of this course will be presented in classroom, laboratory, shop, and field situations. Students are expected to participate in all assignments. Fieldwork, laboratory, and shop projects will be assigned throughout the course with an emphasis on hands-on fieldwork learning. Scholarships are available for the Restoration courses to Alumni of Maine School of Masonry Graduates. For more information call (207) 639-2392 or email masonryschool@tds.net. Students must be 18 years of age or older. Every student must have comprehensive reading, writing and math abilities and a strong desire to put themselves into the ancient craft of masonry. We make sure to keep our class sizes at a minimal so that the individualized attention and care can be given to every student equally. The certificate program is caped at 12 students per year. Students are expected to adhere to the policies of the Maine School of Masonry. Up to six students enrolled in the full-time certificate program may live on-campus in our bunkhouses for a fee. We conduct a four day Introduction to Masonry class to area schools. Being able to offer new generations a future in an age-old profession is a passion with Mitch, the school’s founder, who travels to schools throughout the state. Contact us for more information on availability and pricing at 207-639-2392 or by email masonryschool@tds.net. Read the report about this partnership with Carrabec High School in the local paper, the Kennebec Journal, HERE. We encourage everyone interested to apply: APPLICATION FORM.